GlobalProtect Mobile Security Manager manages mobile device configurations and oversees device usage throughout the organization. As new devices are brought into the business environment, whether they are corporate or end-user (BYOD) owned, the first step is to ensure that the device has been configured appropriately for business use. GlobalProtect Mobile Security Manager works together with GlobalProtect App to manage the device, check the device state and identify devices with malware infections. Mobile devices are creating new ways of conducting business, while also introducing new risk vectors. The challenge enterprises face today is how to make mobile devices secure for business use. Traditional approaches to security have not met the specific needs for mobile devices. Businesses must find ways to make mobile computing safe for business, while still satisfying end user requirements for ease of use and platform choice. Instead of blocking mobile computing, companies must find ways to safely enable mobile devices. GlobalProtect Gateway – GlobalProtect Gateway delivers mobile threat prevention and policy enforcement based on apps, users, content, device and device state. VPN connections terminate at the GlobalProtect Gateway, which provides consistent enforcement of policy and threat prevention for Internet and corporate traffic. The gateway uses apps, users, content, device and device state as policy enforcement criteria. GlobalProtect Gateway runs on the Palo Alto Networks next-generation security platform, which is available in hardware (such as the PA-5000 Series or the PA-200) and virtualized (such as the VM-Series) form factors. GlobalProtect App – GlobalProtect App is a lightweight client that communicates with GlobalProtect Gateway and GlobalProtect Mobile Security Manager. It establishes a VPN connection with GlobalProtect Gateway to protect traffic and enforce policy. It works in conjunction with GlobalProtect Mobile Security Manager to manage devices and share information about the device state. GlobalProtect Mobile Security Manager – GlobalProtect Mobile Security Manager ensures that devices are appropriately managed and configured for use in a business environment. It manages mobile devices by providing the device settings and account information for use with corporate applications and networks. GlobalProtect Mobile Security Manager checks the device state for ongoing compliance with company policies. Information about the device state is shared with the GlobalProtect Gateway for enforcement of policy. GlobalProtect Mobile Security Manager integrates with the WildFire to identify Android devices that are infected with malware. 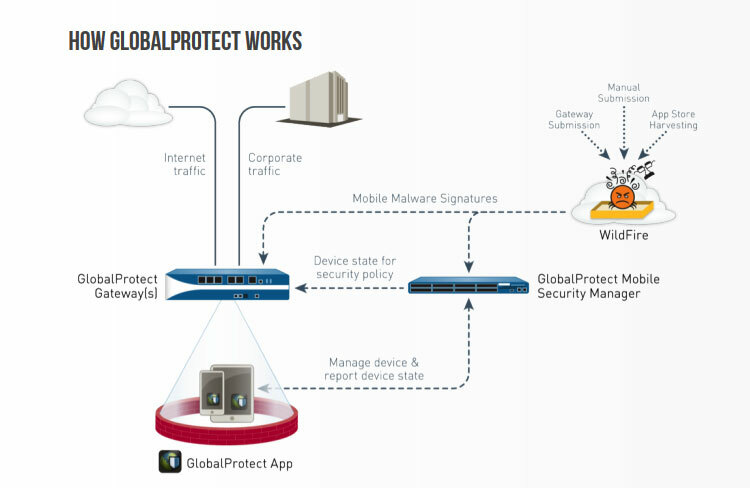 GlobalProtect Mobile Security Manager runs on the GP-100 appliance.